A section of a lobate scarp inside Karrer crater. NAC frame M145557281R, incidence is 71°, image is 0.64 m/px. Karrer crater (52.13°S, 142.31°W) is mare-filled crater on the far side of the Moon, approximately 51 km in diameter. 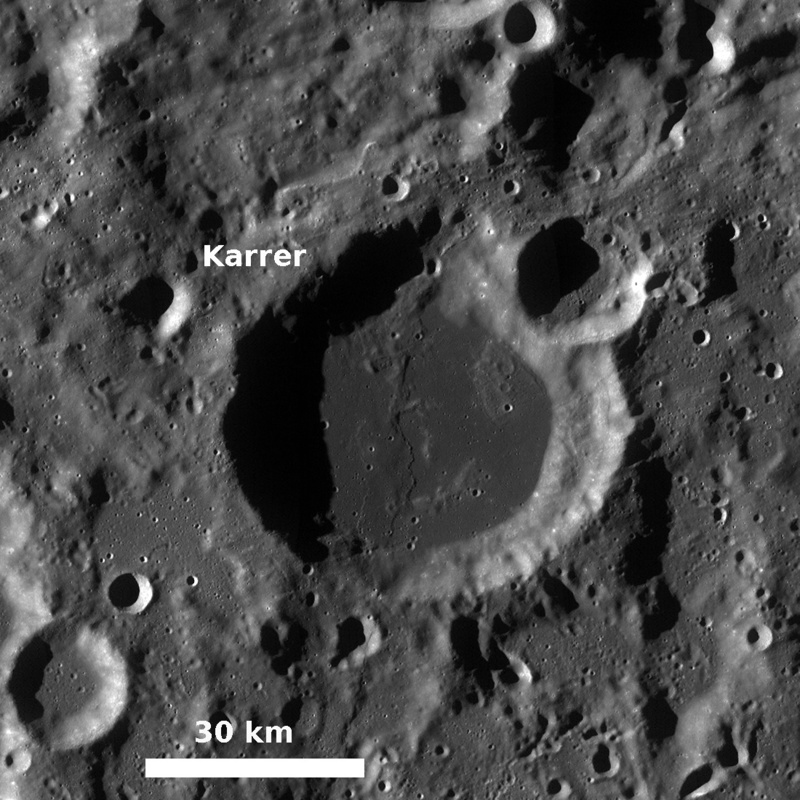 Karrer is special because there are fewer mare basalt surfaces on the far side compared to the near side of the Moon. Within Karrer crater's mare basalt covered floor is a lobate scarp, unofficially designated as Karrer scarp for the crater within which it is located. Today's image shows a section of this scarp, where the deformation of the mare basalt is close to forming the shape of two right angles. Mare basalt surfaces often have lobate scarps and wrinkle ridges, two types of contractional tectonic features. In the WAC monochrome mosaic (below), you can see that the scarp extends south outside the rim of Karrer crater onto highlands material. Lobate scarps are thought to be the surface expression of thrust faults, formed when an upper fault block is pushed up and over a lower fault block.